Of late, the global market for automotive intelligence battery sensors has been observing substantial rise in its valuation. The ongoing expansion in the automotive industry is the main factor that has been propelling the growth of this market remarkably. The increasing CO2 emission and the escalating fuel consumption by automobiles have emerged as a matter of major concerns among people across the world. To curb CO2 emission and for road safety, various governments have implemented strict rules and regulations, compelling automakers to install automotive intelligence battery sensors in their product, leading to a rise in their sales. The need to comply with fuel economy standards is also encouraging manufacturers to use these sensors in their vehicles. All these factors are expected to support the worldwide market for automotive intelligence battery sensors in the years to come. In 2016, the market offered an opportunity worth US$ 2.75 bn. Rising at a CAGR of 18.30% between 2017 and 2025, the it is projected to reach US$ 10.56 bn by 2025 end. Predominantly, automotive intelligence battery sensors find widespread application in passenger vehicles, commercial vehicles, and electrical vehicles. The demand for these sensors relatively greater in passenger vehicles. In 2016, the passenger vehicle segment held 45% of the overall revenue generated in this market. With the increase in demand for safety features, such as monitoring battery in passenger vehicles, the segment is anticipated to continue on the top position over the next few years. Electric vehicles are also emerging as significant consumers of automotive intelligence battery sensors, globally. All three types of electric vehicles, that is, hybrid electric vehicle, battery electric vehicle, and plug-in hybrid electric vehicle, are generally equipped with automotive intelligence battery sensors to avoid mishaps. Over the coming years, the battery electric vehicle segment is projected to become the most prominent of these, holding over 80% of the market share alone. 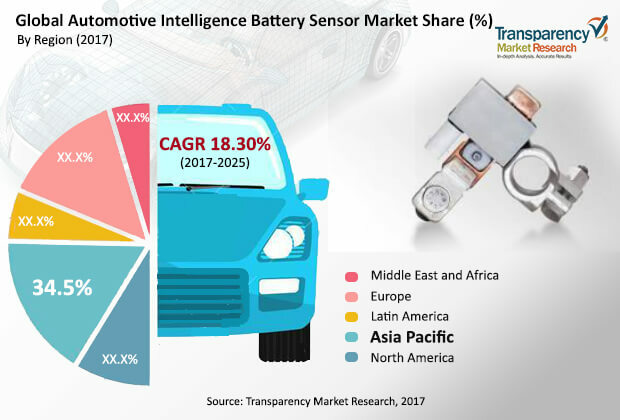 In terms of the geography, the worldwide market for automotive intelligence battery sensors is bifurcated into five regions, namely, North America, Europe, Latin America, Asia Pacific, and the Middle East and Africa. In 2016, Asia Pacific led the global market with a share of 40% in terms of revenue. The regional market is expected to remain on the top position in the years to come, thanks to the increasing uptake of electrical vehicles in China and the augmenting number of international manufacturers here. Europe is the second most prominent regional market for automotive intelligence battery sensor market with a little lesser market share than that of Asia Pacific. This is attributed to increase in the government norms toward the environment and also the reducing emission of CO2 from the vehicle. The global market for automotive intelligent battery sensors is highly consolidated. The Continental AG, HELLA GmbH & Co. KGaA, inomatic GmbH, NXP Semiconductors, ams AG, Furukawa Electric Co. Ltd., Vishay Intertechnology, Vishay Intertechnology, Robert Bosch Ltd., Denso Corp., MTA S.p.A, Abertax Technologies Ltd., and Autotec Components are some of the leading vendors of automotive intelligent battery sensors across the world. This report analyzes and forecasts the market for automotive intelligence battery sensor at the global and regional level. The market has been forecast based on revenue (US$ Mn) and volume (Million Units) from 2017 to 2025. The study includes drivers and restraints of the global automotive intelligence battery sensor market. It also covers the impact of these drivers and restraints on demand for automotive intelligence battery sensor during the forecast period. The report also highlights opportunities in the automotive intelligence battery sensor market at the global and regional level. It comprises a detailed value chain analysis, which provides a comprehensive view of the global automotive intelligence battery sensor market. Porter’s Five Forces model for the automotive intelligence battery sensor market has also been included to help understand the competitive landscape in the market. The study encompasses market attractiveness analysis, wherein end-users are benchmarked based on their market size, growth rate, and general attractiveness. The study provides a decisive view of the global automotive intelligence battery sensor market by segmenting it in terms of technology, voltage, vehicle, electric vehicle and region. These segments have been analyzed based on present and future trends. Regional segmentation includes the current and forecast demand for automotive intelligence battery sensor in North America, Europe, Asia Pacific, Latin America, and Middle East & Africa. The report also covers demand for individual application segments in all the regions. The market for automotive intelligence battery sensor is primarily driven by rising demand for eco-friendly agro products. Industrialization has led to urbanization, which has resulted in migration to cities. The report provides the estimated market size of automotive intelligence battery sensor for 2016 and forecast for the next nine years. The global market size of automotive intelligence battery sensor has been provided in terms of revenue and volume. Market numbers have been estimated based on key Sale Channel, Sales Channel, and regional segments of automotive intelligence battery sensor market. Market size and forecast for each major Sale Channel and Sales Channel have been provided in terms of global and regional/country markets. Secondary research sources that are typically referred to include, but are not limited to company websites, annual reports, financial reports, broker reports, investor presentations, and SEC filings, internal and external proprietary databases, and relevant patent and regulatory databases, national government documents, statistical databases, and market reports, news articles, press releases, and webcasts specific to companies operating in the market, National government documents, statistical databases, and market reports, American Automobile Association, European Automobile Manufacturers Association, Automotive Research Association of India, Organisation Internationale des Constructeurs d'Automobile (OICA), GAIKINDO, MARKLINES, KAMA, IHS MARKIT, Factiva, etc. The study includes profiles of major companies operating in the global automotive intelligence battery sensor market. Key players in the automotive intelligence battery sensor market include Continental AG, Robert Bosch GmbH, HELLA GmbH & Co. KGaA, inomatic GmbH, NXP Semiconductors, ams AG, FURUKAWA ELECTRIC CO., LTD., Vishay Intertechnology, DENSO CORPORATION, MTA S.p.A., Abertax Technologies Ltd., Autotec Components, and others. Market players have been profiled in terms of attributes such as company overview, financial overview, business strategies, recent developments, and SWOT analysis.